New addition to the show featuring the Question of the week. If you don’t have a rack what can you use in the bottom of the pot when water bath canning? Answer: You can use a rolled up dish towel in place of a rack or old rusted canning rings as a rack when water bath canning. I also use canning rings in my slow cooker to roast whole chickens to mimic a rotisserie chicken. 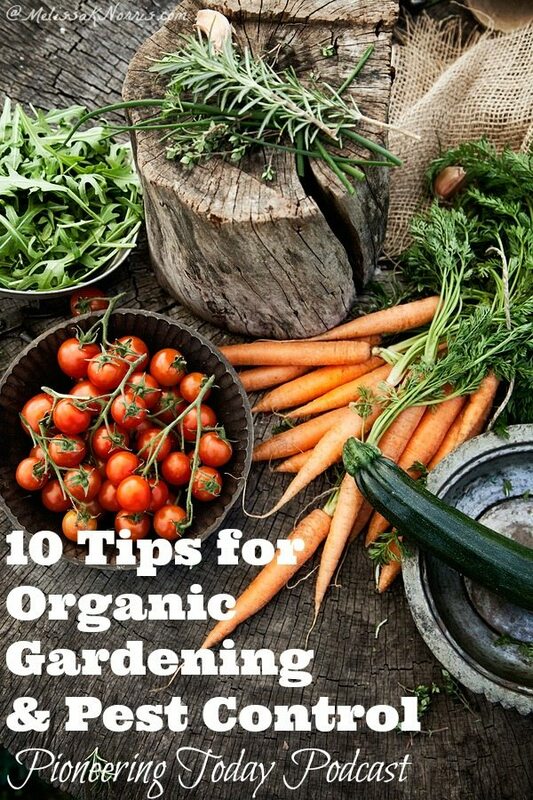 We’ve always practiced organic gardening without knowing it growing up, using methods my grandparents and great grandparents did. Organic gardening is the art and practice of gardening without synthetic pesticides and chemicals. What does the Bible say about food? New Bible study by JourneywithJill.net Look into what the Bible says about food. Those of who practice organic traditional whole foods, do you look at people who eat sugary processed foods with judgment? Does your stand on organic food make your prideful? Awesome look at how our attitudes about food can become a spiritual problem if we’re not careful. First line of defense with organic gardening and pest control is to make sure your plants are healthy. Healthy plants have a better chance of surviving pest infestation. In the fall, amend your soil with mulch or cover crops. We’ll discuss this more in depth this fall. We use chicken manure to amend our soil and using organic fertilizer. Let chicken manure sit with saw dust or straw for compost. Chicken manure is high in nitrate and too hot to put on your plants fresh. Any manure you put on your plants or in soil should be dry and not fresh. Pig, chicken, llama, horse and cow manure are excellent sources of natural organic fertilizer. Start your own composting at home with these 7 DIY Ways to Begin Composting at Home. We don’t fertilize after we plant. When we plant our tomatoes and peppers we put compost, crushed up egg shells, and a few tablespoons of Epsom salt to the hole. Another way we add natural organic fertilizer to our garden is used coffee grounds. Potatoes like acidity to help keep scabs from forming on the potatoes. You can use old leaves when hilling or used coffee grounds. A little bit goes a long way. Don’t leave it clumps or too much, because grounds are wet, you can introduce mold and it won’t break down properly. We had a flea beetle attack our tomatoes and potatoes this year. It can damage the leaves and weaken the plant. If a heavy infestation it can kill the plant. You can use coffee grounds in the soil when planting your plants. The flea beetle hatches in the spring and used coffee grounds inhibit them from laying their eggs in the soil. The key to a healthy garden is checking on your plants daily. If they’re beginning to get infested or disease, catching it early is key. Manual removal of bugs is often the best control. I manual removed the flea beetles from the leaves. You can also use organic Neem oil to kill bugs. It’s an oil from the Neem tree from Africa. Never spray your plants in the heat of the day so you don’t scorch or burn the leaves. Early morning is best. At night the dew can wash the spray off. Never apply before or in the rain. Evening time also is usually windier than the morning. Even with organic, you don’t want the spray getting in your face or skin. Neem’s oil requires two applications about 10 days apart. Be sure to label your spray bottle. Don’t save the spray, use it all at once and mix fresh for each application. Organic pest method we use is Diatomaceous earth or DE. Food grade is safe to eat if you wanted, but makes it safe for veggies. DE is a white powder made from crushed up fossilized remains of phytoplankton. When sprinkled on exoskeletons, like ants, fleas, and mites it comprises the coating of their skeleton. It’s safe for humans. You can use it to clean chicken coops and to help get rid of mites in your coop. DE is great for beans, broccoli, and cabbage to keep the bugs from crossing the soil to get to the plant. We haven’t tried it with slugs, but DE is a much better bet than salt. Salt kills slugs but also damages your soil. Organic method for cabbage and cauliflower is crop and row cover cloth. Put cloth over plants in the early part of the season when moths are laying their eggs. Huge pest to our garden and plants are deer, elk, and occasionally cattle when they wander out of the pasture. Our free range chickens can also pose a problem to our fruit and vegetable crop. We use netting and fencing to keep the larger pests away. Plastic netting works great on blueberries and raised beds. We fence our garden with metal t-posts and metal fencing. It’s been up for over 6 years and keeps dogs, cats, and larger animals out of our garden. Our young fruit trees have four tall metal t-posts around them and we use chicken wire and plastic fencing around the main part of the tree and fruit. Be sure to check your water levels. If the plant is stressed from lack of water, any kind of pest will kill it that much faster. A deep watering once or twice a week is much better than daily watering, depending upon your climate and summer. Soaker hoses on the tomatoes and peppers overnight has provided a much better benefit than daily watering. This post is featured on The Prairie Homestead Blog Hop. Previous Post Blueberry Jam Recipe without Pectin and Low Sugar Next Post Re-Usable Tattler Canning Lids-Do They Work?